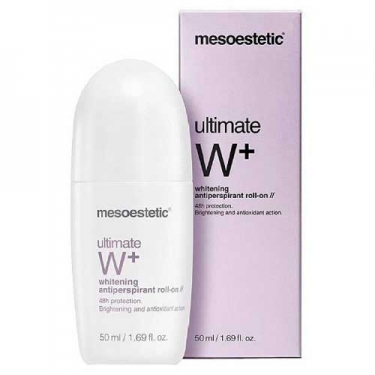 DESCRIPTION: Ultimate W+ Whitening Antiperspirant Roll-On from Mesoestetic is a daily-use deodorant that regulates and reduces excessive perspiration thanks to its long-acting antibacterial and antiperspirant agents (48 hours). Its antioxidant and whitening complex effectively protects the skin from daily aggressions (0V radiation, etc.) and inhibits tyrosinase and a-MSH, both of which are involved in melanin synthesis processes. This roll-on helps to lighten the tone of the skin of the armpits, avoiding the appearance of dark spots. Its alcohol-free formula, with aloe vera and vitamin E, ensures great tolerance and protects against irritation, taking care of and relieving armpit skin. Even after epilation. Maximum comfort thanks to its roll-on format that allows the exact amount of product to be applied to the skin. A light fragrance and light texture for a pleasant feeling of freshness. Wash and dry the armpits thoroughly to promote proper application of the deodorant and prevent bacterial growth.